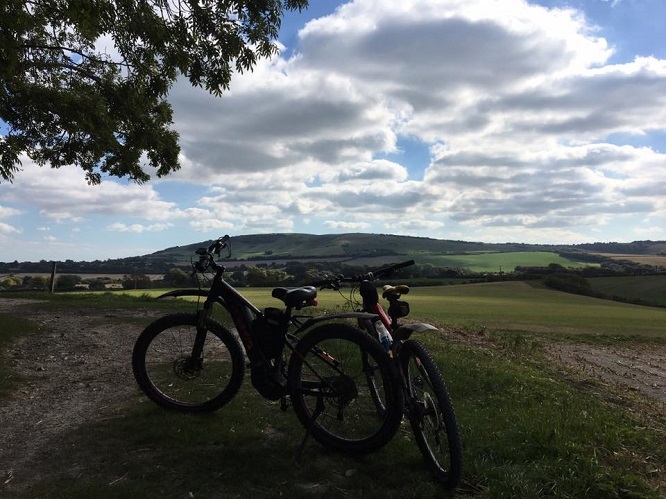 On this page you will find my musings on all things to do with electric bikes – what they are, who uses them, and how, as well as the legal and technical aspects of owning and riding an e-bike in the UK. Just click on ‘Rod’s E-bike Thoughts’. You will also find my work-in-progress project which is ‘Rod’s E-Bike Routes’ . There you’ll find various local routes I’ve ridden which I feel are particularly suited to electric bikes. 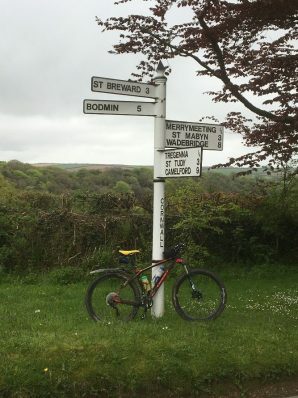 They are a mixture of off-road, cycle paths and road sections, with an emphasis on exploring the Seahaven area by bike and the enjoyment to be had therein. Of course you can ride the routes on a normal bike but the hills are a lot harder and the ride takes longer. As a guide, these routes have been ridden by my wife and I and we are both fifty-something with no special cycling skills. I’ll try to add to and update the route information as and when I can. Click your mouse on where it says ‘click here’ below to expand the content and show the route details. Electric Bikes – Work Of The Devil or Transport Saviour? Reliable official data is hard to come by but a brief look around your local town and trails should show you that electric bikes are finally gaining a foothold in the UK cycling market. E-bikes now account for about a quarter of cycle sales in the Netherlands and are even outselling normal bikes in Germany. So why do we appear so reluctant in the UK when it comes to taking the strain out of cycling? An e-bike will have various sensors measuring data such as how many times a minute you turn the pedals through a complete revolution, your speed, how hard you’re pedalling, what assistance setting you’ve chosen, and how hard the motor is working to assist you. A central processor unit will use this information to determine how much power to send to the crank to help you with your pedalling. The battery supplies the power to the motor that drives the crank that helps you turn the pedals. Older or cheaper e-bikes will have the motor built into the hub of the front or the rear wheel. What Is The Legal Definition Of An E-bike? Who Buys An Electric Bike? So now we know what an electric bike is, but who uses them in the UK? And why are we so far behind other countries in adopting electrically assisted pedal cycles? 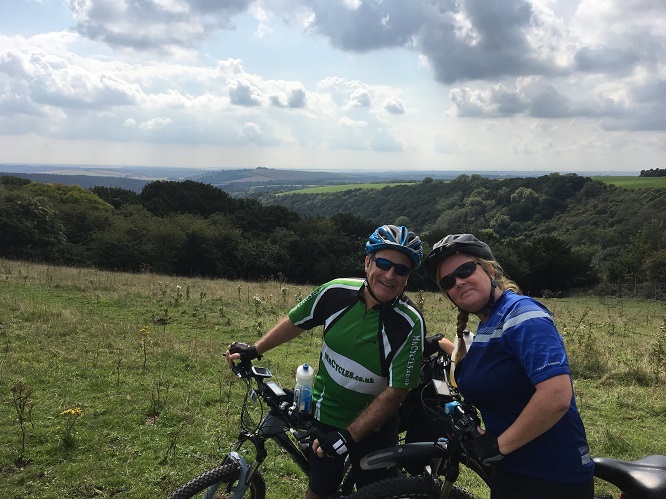 Having spent many years cycling in the UK and abroad, and 11 years in the cycle trade, I’ve noticed there is one very significant difference that sets the UK cycle market apart from its neighbours – we mostly cycle for fun and fitness. Of course there are exceptions, but the vast majority of us do not use bicycles as a means of transport. We race, we endure, we get fit, lose weight, we jump, do tricks and raise money for charity on our bikes. We do not commute to work, ride to school, visit friends and family, go on holiday, pop down the pub or do the weekly shop on our bikes. Our bikes are built for speed and we must wear special cycling clothes and shoes in order to travel further and faster. I’m not saying that’s wrong, and obviously I am generalising massively, but on the whole the majority of us cyclists do not use our bikes as a form of transport, but…the good news is…more of us are. As a cycle retailer I can see those differences in cycling habits reflected in the type and style of bikes on offer in the UK compared to those on offer across the rest of Europe. Most of the bikes ridden in the UK come under the heading of sport and leisure, whereas more of the bikes ridden in Europe are utilitarian and often unisex. I used the word ‘ridden’ deliberately. 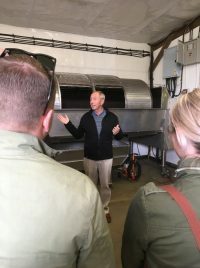 My business also has a large cycle service and repair workshop I am also very aware that there a lot of bikes that are purchased one summer, ridden half a dozen times and then left in the shed to gather dust and rust. I see these bikes when the kids have grown up and their owners want to get fit again, or grandchildren come to stay, or sons and daughters go off to university and need some transport. Which leads nicely into another reason electric bikes are becoming more popular. Now that the technology has been proven, and car manufacturers and governments are forcing or encouraging us to adopt electric cars, the switch from vehicles using fossil fuels will come swiftly, and some of that acceptance of electric cars will rub off onto sales of electric bikes. You don’t have to sit next to someone who hogs the seat and may smell less than savoury! A bike is an attractive option if you already have access to one and are reasonably fit, but if you don’t have one and you’re not that fit then an e-bike begins to be an attractive option. Admittedly an e-bike is always going to be more expensive to buy than an equivalent non-powered model, but it’s a whole lot cheaper to run than a car. Who??? We already have electric drills, saws, chairs, food mixers, lights, toys, milk floats and now cars. Why not bikes? We don’t all RUN around in cars like the Flintstones with our feet poking out the bottom. And yet when I’m riding an electric bike, or talking to customers in my shop, people’s reaction to them is very often a negative one. People I’m not even talking to will approach me, point an accusing finger at one of the electric bikes on display and declare vehemently, ‘I don’t need one of those! It’s cheating!’ It’s weird! It’s like they’ve spotted a year’s supply of EPO amongst the energy gels! Generally, guys don’t walk into a chemist and feel the need to point at packets of Viagra and declaim, ‘I don’t need those!’ Women don’t feel the need to decry hair dye as the work of the devil, but people do feel the need to come into my shop and engage me in conversation about electric bikes and then tell me they don’t need one with an air of righteous indignation. It seems like the majority of cyclists prefer to be masochists flagellating themselves on the wheels of their machines grinding their way up another hill and into another headwind. And that’s fine. I get it. The purity of rider and machine alone against a cruel world, and yet…over the years we’ve added gears, suspension, disc brakes, aerodynamic profiling, pneumatic tyres, etc. to make our riding smoother, easier, faster, and safer. When you’re commuting to work on an e-bike and you’re home 30 minutes quicker than if you went by car you’re cheating no-one but the people left fuming in the queue of traffic behind you. If you’re getting older and the joints and muscles don’t work quite like they used to but an e-bike means you can still go on the club rides you’re cheating no-one but Old Father Time. And if you get to ride with your mates and have fun because you’re not worried about being able to keep up with them then you’re not sat at home watching TV and piling on the pounds. A good bike is one you don’t even think about. It’s a catalyst to experiencing fun and enjoyment. A catalyst is something that accelerates or enhances a (chemical) reaction without itself undergoing a permanent change. That’s what a good bike does. For people who ride electric bikes it’s really not about the bike – it’s about what an e-bike allows them do. A good, well-maintained bike takes away the mechanical hassles of cycling. A good electric bike takes away those mechanical hassles, as well as the pain of cycling, and leaves just the joy. The joy of cycling with your mates again on the rare occasions that work and family life allow, even though you’re not as fit as you used to be. No more do you have to be embarrassed at always being last, and your mates don’t have to be frustrated waiting at the top of every slope until you arrive panting and red-faced just as they zoom off again. It’s about getting the top of all the hills around you just to see what’s there; to wander down new trails and explore, safe in the knowledge that you’ll have enough puff to get back home again. An e-bike is increasingly the choice of busy, young professionals who perhaps used to ride when they were younger, and would really like to go riding with their friends, but don’t have the time available to go cycling regularly. Because of that they can’t get fit enough, or maintain their fitness, such that they don’t feel embarrassed about being the chubby one at the back – again! It’s a shame but these people give up before they start. An e-bike can bridge that gap between you and your friends who are zooming away down the trail leaving you dragging behind. It can also get you fit. This is the biggest fallacy I encounter amongst most people: ‘It’s doing all the work for you.’ It’s not! What an e-bike does is assist your pedalling at a level chosen by you. You can have a lot of assistance, a little, or no help whatsoever from the motor. 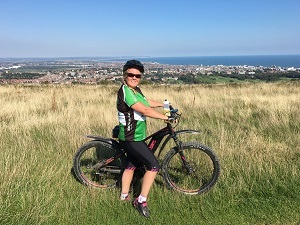 Previously my wife gave up cycling for several years because a muscle problem meant she was physically unable to cycle beyond just a very short distance and it certainly wasn’t enjoyable. 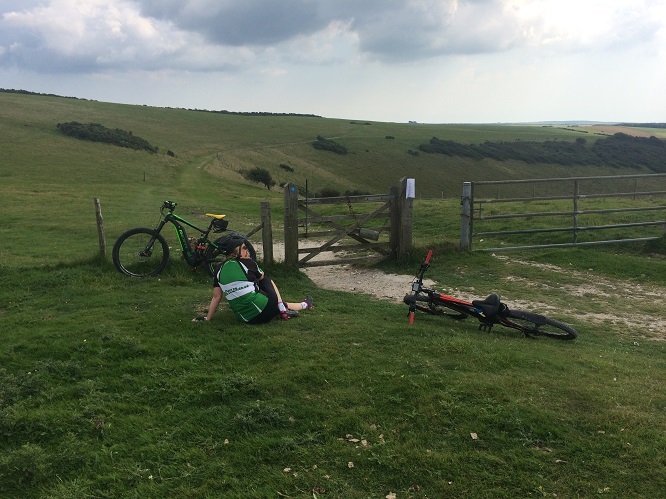 Charging the slopes of Firle Beacon and climbing hills above the Long Man of Wilmington were physical impossibilities. Sadly, the less she did, the stiffer she would become, the less she did. But all that has changed. One of the perks of owning a bike shop means I get to ‘borrow’ lots of nice bikes, and once Giant Bicycles produced a crank-driven electric mountain bike with a frame small enough I knew it could be the answer to my wife’s problem of lack of strength and endurance. All I had to do was persuade her to try one…it wasn’t easy. At first it was the same, sad, old story I hear too often – it’s cheating/they’re heavy/they’re too expensive/people will laugh at me/I don’t know how to use one. Now I can’t get her off it! Over the last few years my wife and I have re-discovered our love of cycling together. 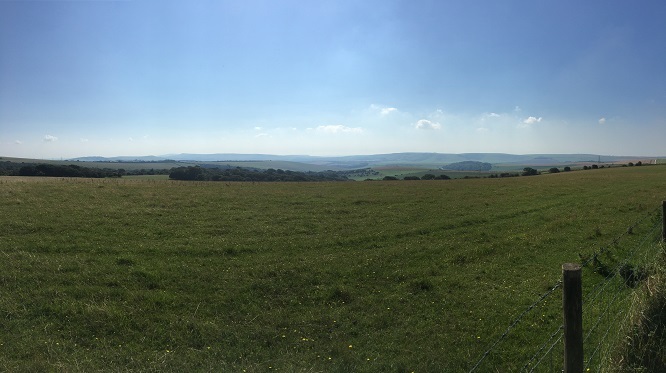 We like to explore the beautiful Sussex countryside we’re so lucky to have around us, and we enjoy the tea gardens, beer gardens, nature and history of the South Downs National Park (and beyond) whenever time and weather allow. We’ll often be found sitting outside with our two electric bikes enjoying some outdoor refreshment when the nudging and whispering will start on neighbouring tables: They are I tell you. No they’re not. Yes they are! I imagine it’s similar for film stars. Eventually someone will pluck up the courage to ask the familiar question: Excuse me. I’m sorry to bother you but could you settle an argument for us. Are your bikes electric? Then the usual: it’s cheating/they’re heavy/they’re too expensive/people will laugh at me/I don’t know how to use one. I’ve already mentioned how good e-bikes are for getting people back on their bikes to ride with their friends rather than sit at home because they’re worried they can’t keep up, but this was really brought home to me recently when I took out a group of my old friends who hadn’t ridden for years for a ride over the Sussex hills and through Friston Forest. Again, it took some persuading to get them to get them to agree to ‘cheat’, but eventually off went the four of us on our electric bikes. We started gently by cycling along the seafront and then up the Ouse valley to Southease and our first refreshment stop. Although we stuck to cycle paths wherever possible, there were occasional bits of cycling on road. However, the guys negotiated these sections with ease with the growing confidence from knowing that they weren’t pedalling slowly and aggravating impatient drivers. In fact, they often found they could keep up with the traffic flow. Spirits were high as I explained that after coffee and cake we were heading up Itford Hill, and past the radio towers on Beddingham Hill, where we would then drop down to the Old Coach Road that runs along between The Downs and the villages of Firle, Alciston, Berwick and on to Alfriston. You what!? I can’t get up that hill! You’re joking! Next thing I know the four of us are admiring the vista of the River Ouse snaking its way towards Lewes Castle between Kingston ridge and the hill fort of Mount Caburn to the east. 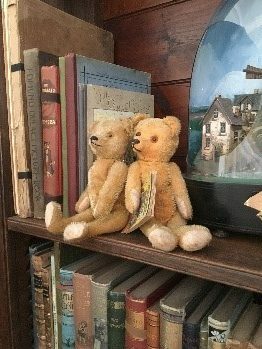 Then we’re flying down the hill towards Firle, splashing through the puddles on the coach road like kids, and finally sitting in the late summer sunshine in the garden of The Cricketers. The four of us together. Bantering like we’re teenagers – except we’re not. We’re four unfit fifty-somethings. One with a new knee, one with ankylosing spondylitis, one non-athletic homeworker, and one overweight, stressed, self-employed business owner who’s sneaked out for a long, long, long overdue day out with his old mates. And that’s when I realised why we’d had so much fun on those electric bikes – we were all on the same level. No-one got annoyed or embarrassed waiting for the slow one. We all got up the hills just fine and at the same speed. We rode together. We laughed and joked together. Four old men that had been once been cyclists were now cyclists once more. My friends may not be electric, but they were certainly buzzing. IT’S NOT CHEATING! You can’t just push a button or twist a throttle and go – that would be illegal. You have to pedal. How hard you pedal is up to you. Just ride it like a normal bike, use your gears, and choose the level of assistance you want or need. Happy cycling. Here you will find fully interactive maps of local routes I’ve ridden. Although the rides are a mixture of roads, paths and trails you will need a mountain bike to ride these routes. You can download GPX files for your phone or GPS device. If you click on the maps below you will be taken to the ‘MapMy Ride’ app where you can view the route in detail. If you create your own free account you can then download the GPX files or send them to your Smartphone (you’ll need to download the free MapMyRide app to your phone first). This ride can be very slippery when wet, and always steep in places – up and down! The views are well worth the effort though. 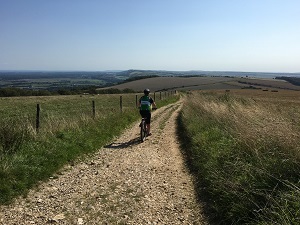 It’s 29 miles through Seaford, Friston, Butts Brow above Willingdon, Jevington, Alfriston, Southease, and Newhaven on some of the best off-road cycling the South Downs have to offer. Cycle paths are used between Newhaven and Seaford on the return leg, and sadly there is no easy route through Newhaven town centre and across the swingbridge. Click HERE to open this ride in ‘Map My Ride’ in a new window. See below for my ride navigation notes. I’ve started the ride from where the ice-cream van normally parks on Seaford seafront near the Salts Recreation Ground. Plenty of free parking to be had here. 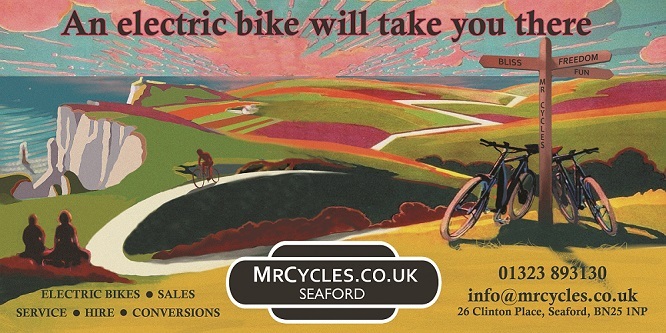 Head east along the promenade cycle route until you reach Seaford Museum at the Martello Tower. Then it’s onto the road following NCN Route 2. Emerging from the pub car park at the bottom of the hill, cross the River Cuckmere, then next left and first right into the Friston Forest car park. 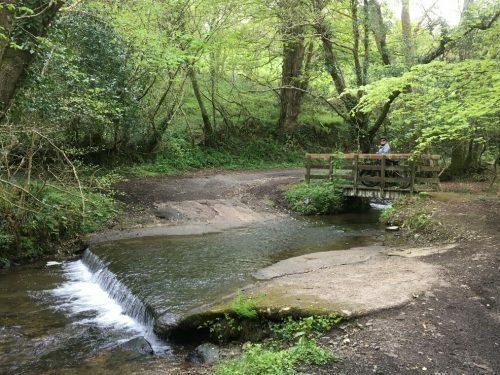 As you enter turn left and pick up the cycle trail to West Dean pond. As you pass through a low flint wall in front of Pond Cottage take the gravel forest road to the right. Follow the gravel road for about 1.5 miles until the path veers to the left past the pumping station. Then you pick up a tarmac road that runs past a few houses in the forest. Do not follow the cycle path as it heads off the tarmac and continues onto the car park at Butchers Hole, but instead follow the road uphill until it meets the Jevington Road. Turn right towards the A259 coast road, but before you reach it turn sharp left onto Old Willingdon Road. Follow this old coach road for about 3 miles (crossing The South Downs Way) until you reach the fantastic viewpoint above Willingdon and Eastbourne that is Butts Brow. After admiring the view you will need to backtrack a little bit to the signposted bridlepath that swoops away down a grassy slope (it was on your left as you headed up) that sees you emerge into Willingdon Lane beside the former Hungry Monk restaurant in Jevington complete with blue plaque proudly claiming it as the birthplace of Banoffi Pie. Turn right. 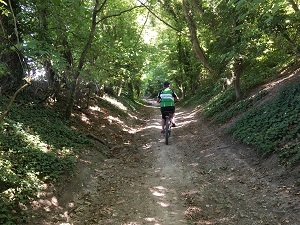 As you crest Windover Hill the trail becomes a very rutted, sunken track of chalk and flint. Beware! Chalk is very slippery when wet. Even in the dry choose your rut carefully and descend slowly. At the bottom when the track reaches the road you have a choice: Cross the road and continue to follow the SDW down a very rutted, sunken track which is worse than before with many large, loose flints and tricky tree roots, or turn left onto the road and whizz down the road on Chapel Hill. The route on ‘Map My Ride’ follows the road. Pass tiny Lullington church hidden behind the hedge halfway down the hill and take the first right at the bottom by the big wooden, barn towards Alfriston. The two routes come back together at the Milton Street turn-off where the road turns left and you cross the River Cuckmere once more. At the T-junction turn right. (Note: If you turn left you will be in the pretty village of Alfriston with a choice of pubs, restaurants, tea rooms and village stores). After 50 yards take the first left into Winton Street. At the top of Winton Street the road turns sharp left into West Street but we’re going to carry straight on back towards the heights of The Downs. Our route curls leftwards and upwards until we reach a crossroad of tracks and we re-join the SDW by turning right through a gate. 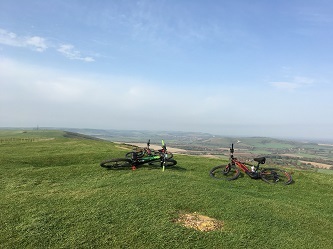 Don’t forget to take a trig point selfie and admire the view at Firle Beacon. Keep following the SDW along the green, superhighway of The South Downs towards the radio masts in the distance. 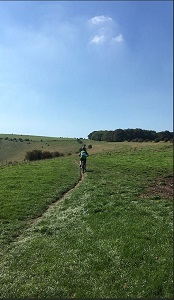 Carry on past, still following SDW, and descend Itford Hill (much easier than Windover Hill) towards Southease and the opportunity of tea and cake at the YHA cafe. Turn left into Piddinghoe village. After about 50 yards do not head uphill following the road, but instead take the footpath on the left below the church that leads to the riverbank. You’ll need to dismount. Follow the river round below the church and the old schoolhouse. Walk across the slipway and carry on along the top of the riverbank. As you approach the sailing lake you should drop down onto the wide path below where you can re-mount and carry on towards Newhaven. Just after some electricity poles on your right, and just before you reach the incinerator on the opposite bank, you’ll see a path heading off to your right away from the river. Follow that across Newhaven’s old rubbish dump (now capped with spoil from excavating Brighton marina) and arrive in Robinson Road via the recreation ground. Turn right onto Robinson Road and then immediately sharp left up Elphick Road at the rear of The Jolly Boatman pub. Follow Elphick Road south to a dead-end where you pick up a cycle path besides the A259 Newhaven ring road. 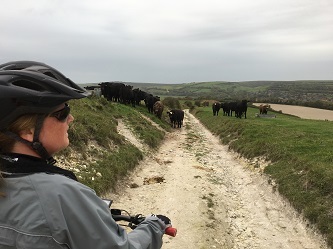 As with Piddinghoe, there are several options between Elphick Road and picking up the cycle path near Sainsburys before heading across the reserve to Seaford. I’m happy for you to find your own way but here’s what I’m suggesting: Head towards the bridge, dismount by the pelican crossing, and cross to the other side of the road before crossing the swingbridge towards the train station. The shared use path can be very busy along this section and there are a lot of road crossings. One alternative might be to use the road from Elphick Road, cross the bridge, turn left and then down under the flyover, across railway line and straight across the mini roundabout (markings obliterated by traffic) before re-joining the cycle path near McDonalds. Either way, once you’re on the cycle path past Denton Corner it’s plain riding all the way back to your start point on Seaford seafront. A cracking ride I’m sure you’ll agree – no buts! 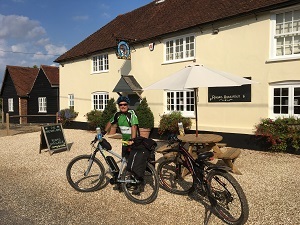 So here’s a ride I wasn’t expecting to do until a year later but the planets aligned, the weather gods smiled, a good friend offered us a lift to Winchester, and the pub at Graffham had a spare room on the date we needed. 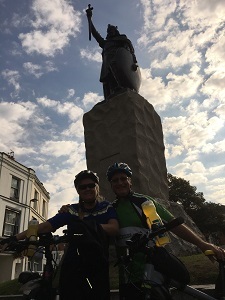 The plan was to ride the length of The South Downs Way from the King Alfred statue in Winchester to Beachy Head, Eastbourne. Just over 100 miles. We stopped the first night at The Foresters Arms, Graffham; the second day we finished at Devil’s Dyke, Brighton, before re-starting there on day 3 and heading for Eastbourne. 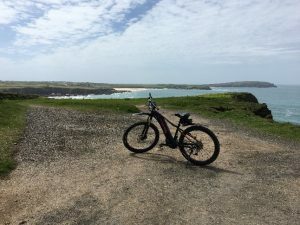 My wife was on her Liv Vall-E+ 2 electric bike and I took the opportunity to road-test one of our electric hire bikes that we’ve converted – especially as I was carrying all the supplies for the first two days! We did the ride at the beginning of September 2018. The weather forecast was good, and the last day of our 3-day journey coincided with my wife’s birthday. What could possibly go wrong? As it turned out, nothing really – celebrations all round! Click HERE to open this ride in ‘Map My Ride’ in a new window. You can download ‘Map My Ride‘ for free to use on your PC and/or phone. See below for my ride navigation notes. We started by the statue of King Alfred who can be found hanging around outside the mayor’s office in The Broadway, Winchester these days. The three of us posed for a quick selfie and we were off. We crossed the M3, endured a mercifully short stretch alongside the A31, crossed the A272, passed the site of the massive Boomtown festival in Temple Valley, and headed East. Note: riding East (or West) for 3 consecutive sunny, summer days can make for an interesting tan! Caution: When crossing the busy A32 at the village of Warnford by The George & Falcon pub in order to begin your long ascent to Old Winchester Hill you will be crossing on a blind bend with cars approaching at +40mph. Take care. The signposting of the SDW through the country park is not the best but persevere and you’ll be fine. I used a mixture of the official SDW signposts, Ordnance Survey maps on my phone, and the route I’d created in Map My Ride to find our way. I also had an extra battery for my phone. 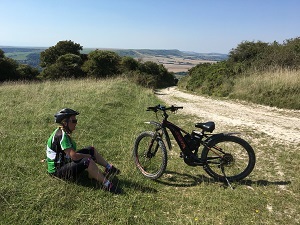 Riding along a ridge of chalk like The South Downs can bring you beautiful distractions in many guises in any direction, but at Harting Down you are spoilt for choice. 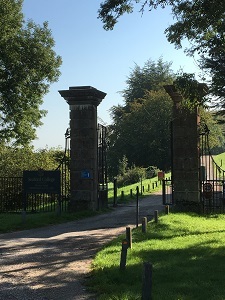 There’s the National Trust property at Uppark House (former home of the Fetherstonehaughs) with fine views to the south – and a cafe. Then, just a little further along and to the north side is Tower Hill – home to a Grade-2-listed folly called The Vandalian Tower. It was built by the Fetherstonhaughs as a summer house for partying – something the delightfully eccentric Sir Harry Fetherstonhaugh excelled at. You cannot visit the tower as it sits on a private part of the Uppark Estate, but once you’ve passed the little car park on your way to Beacon Hill, you can seek out one of the perfectly-positioned benches which hide down little paths between the bushes on the North side of the escarpment with fine views to the villages of South Harting, West Harting and East Harting, and the wonderfully-named Didling. The distinctive church spire you can see is the copper-clad one at South Harting. Cross the A286 just above Cocking (South Harting, Cocking, Midhurst or Graffham are all suitable villages to stop overnight). 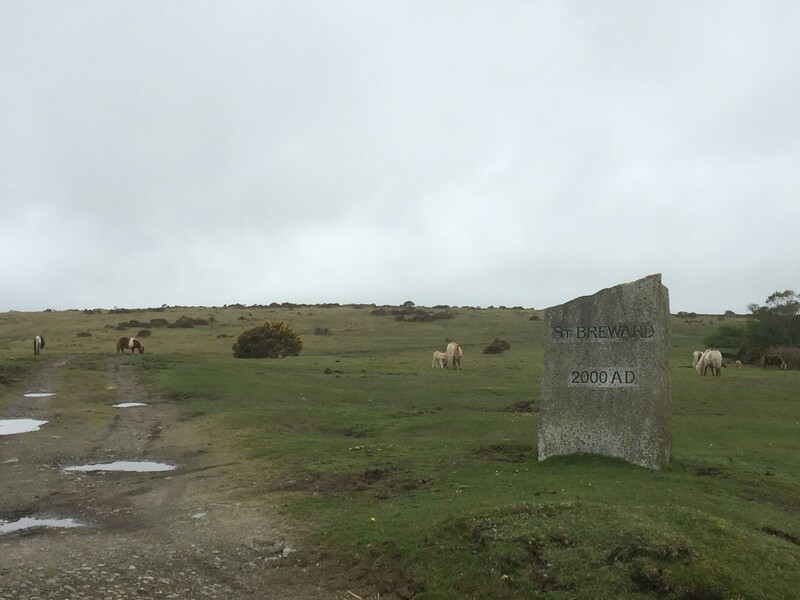 Lord Cowdray and his tenants have concreted the trail on the climb up from Cocking towards Graffham which makes for an easier ride at the end of day 1. The turn-off from the SDW on your left to pick up the route down to Graffham is well sign-posted, but take care. You may be tired but you’ll need to keep your wits about you. As you descend the wooded hillside, with thoughts of food, beer and bed, the wide trail becomes very deeply rutted as a result of regular, estate-worker traffic. There’s no shame in putting your pride before a fall and walking the odd stretch of trail you think may be too dodgy to ride, but there can be shame being covered in chalky mud with blood trickling down your leg. Thankfully we descended without incident and soon found our way to the bar at The Foresters Arms in Graffham and a welcome night of rest. Day 1 complete. 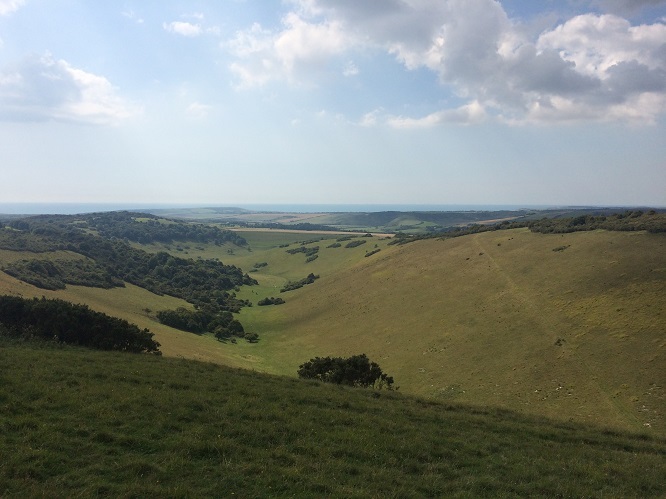 On day 2 of our journey we would travel from Graffham to Devil’s Dyke just north of Brighton. A finishing point that meant we could spend the second night at home, returning to the same spot early next morning to resume our journey on day 3 having jettisoned a lot of our luggage. Having done quite a long stint on Day 1 meant that our day 2 mileage was relatively short. That meant we could leave at a sensible time in the morning leaving plenty of time to enjoy a nice, cooked breakfast before we set off. 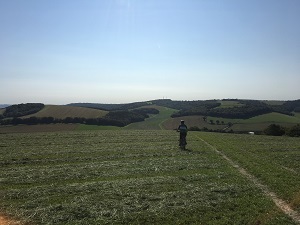 After the long, and at times tricky, descent from the top of the Downs into Graffham the day before, we decided upon a shorter but steeper path back up to rejoin the SDW. It was VERY steep, and in places just as tricky as the previous day’s descent. There were notices up referring to maintenance works to the trail so I can only hope these were about to start and would include both routes. There was a moment where I did question the extra sausage I had for breakfast as I struggled up a particularly steep and slippery section, but thankfully this route was much shorter and we emerged from the dark, green forest canopy to more heavenly blue. With more sunshine and fewer miles it was going to be a fine day. 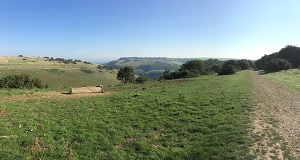 Today would be a day of following in the footsteps of Romans at Bignor Hill, an intriguing sight above Chanctonbury Ring, and a pleasant detour into Steyning. Heading East we crossed the path of Roman invaders when the SDW intersected the route of Stane Street atop Bignor Hill (a Roman road that ran all the way from Chichester to London), descended Bury Hill to cross the A29 (not too bad), and then a tricky little rutted and flinty route down towards Amberley and the crossing of the River Arun. 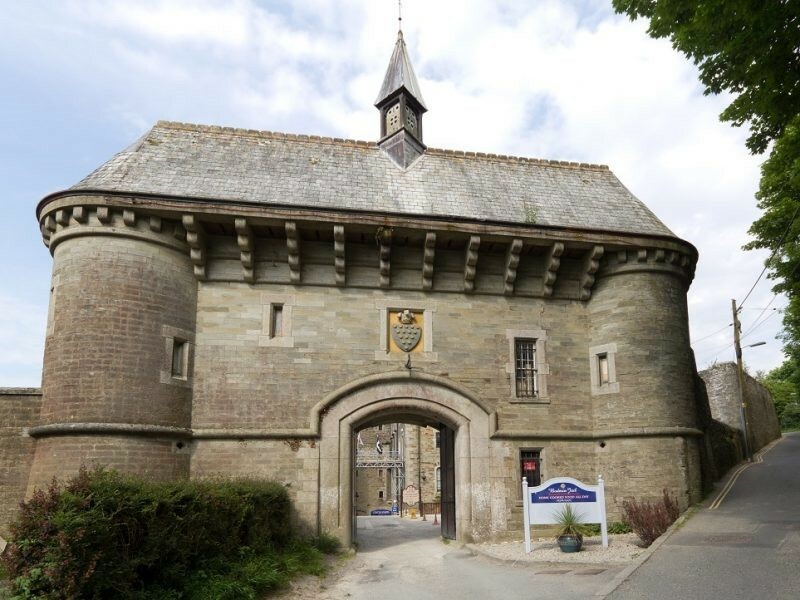 There’s an intriguing glimpse of Amberley Castle (now a hotel) off to your left just before you reach another treacherous road-crossing on the B2139 just to the North of Amberley village – take care. Having descended into the river valley you must of course head back up. At first it’s on tarmac but then just past the entrance to a nice, big house, the SDW is signposted off the road to the left. You can go this way but you will be pushing your bike – it is VERY steep and treacherous if wet. We took an alternative route via the farmyard you can see ahead of you up the road. The route is quite clear. It avoids some very steep climbs and the farmer had left the route clear with gates open when we went through. Caution: If you take this route and you consult a map it will show it continuing past the point where we turned left (see my route on Map My Ride) to rejoin the SDW via a sunken pathway. The maps show a different route where it is possible to re-join the SDW further on but it is overgrown and quite impassable. Route choice is also important as you descend towards crossing the A24 near Washington. The SDW is signposted in two directions – take the lefthand one to cross the A24 via a bridge rather than having to dodge four lanes of traffic doing +80mph! Your reward for making it safely across is another steep climb! People were amazed to see us cycling up it (and so was I!) 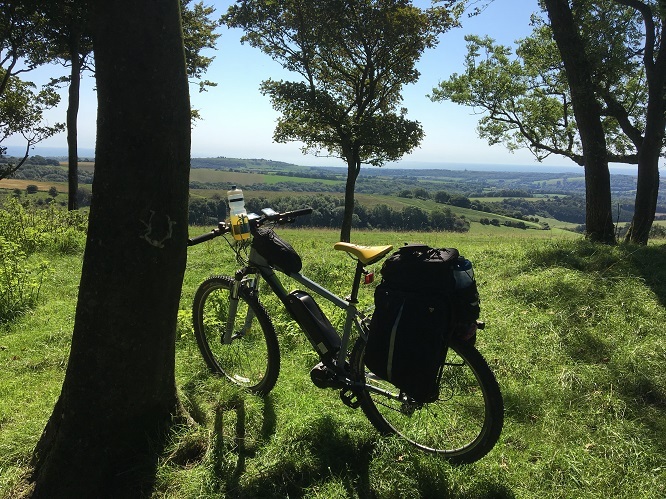 but we forgot about the hard work when we took a break on Chanctonbury Ring to enjoy the views towards the sea and some welcome shade under the trees. That’s when I saw, what I later discovered was, a White Stork for the first time in my life. After a pleasant interlude we began our descent towards another river crossing, the River Adur just below Upper Beeding. 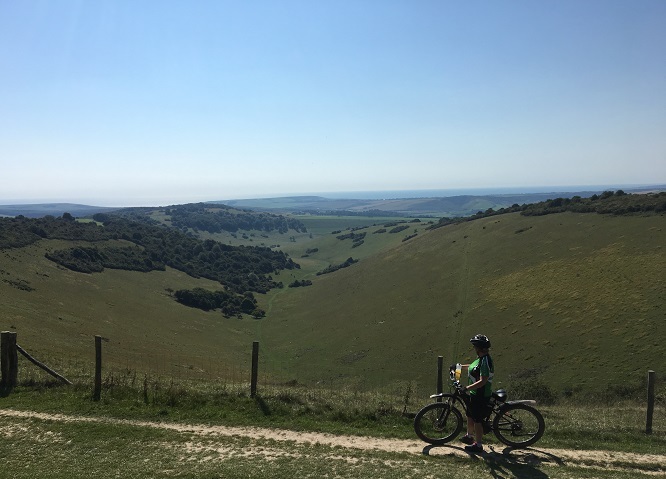 However, before we reached there we enjoyed another pleasant interlude and refreshments in Steyning – we were making the most of a low-mileage day. After crossing the bridge, and as you turn at the first sharp left as you approach the road, you will find another water tap. There’s good visibility as you cross the A283 and good visibility of the start of the long climb towards Truleigh Hill. After you pass the Youth Hostel and telecommunication aerials it’s not too far then to our finish at the end of day 2, the pub at Devil’s Dyke. Just one note of caution though: you will see the pub in the distance, and there is a trail that runs towards it, but don’t follow it unless your bike is light. There is a kissing gate across the path just before the pub. What you should do if you have heavier bikes like our electric ones (mine has the luggage on remember) is to follow the SDW which pops out onto the road just to the south of the pub. Day 2 complete. For now head to the bar, and then summon a lift home, because tomorrow will be a devil of a ride! 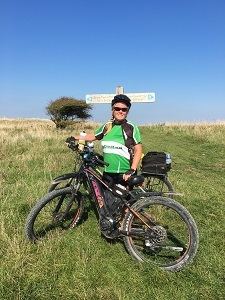 Day 3 of our journey would see us resume the SDW where we left off at the end of Day 2 – crossing the road that leads to the Devil’s Dyke pub and National Trust car park and heading East. It was about 8.30am, the sky was clear and blue, the grass was green with a shimmer of dew. There was no wind, it would be a beautiful day to finish our 100 mile ride, but it would be a warm one. My panniers were empty but my rack bag contained spares, snacks and plenty to drink. Thoughts of the hills to come (the climb up from Pyecombe, the short and nasty ones either side of the A27, the long drag up to ridge above Kingston, Itford Hill, Windover Hill, and the final long drag out of Jevington…) were far from our mind as we set off in high spirits. We didn’t see the devil digging any more dykes but we did see a few runners and a few riders coming up towards us. Some of them looked like they were having a hell of a time. Where the trail was narrow we stopped to let them pass. At the bottom we passed through Saddlescomb Farm which is the only farm I know with a donkey wheel to pull up water from a well. Through the farm and up and over and then down again to the bridge crossing the A23 at Pyecombe. Up and over Pyecombe village and then another road crossing (A273) to follow the SDW up through Pyecombe golf course. Bearing in mind it was about 9am on a Sunday morning, that road crossing took forever owing to the amount of traffic, its speed and limited visibility. Take care. We overtook some horses on a narrow section of the trail. We approached slowly and announced our presence by talking to the riders and they waved us past when they could. The views of the landscape around us were becoming more familiar to us as passed the Jack & Jill windmills over to our left. We continued through the car park at the top of Ditchling Beacon without stopping. That’s where humans gather round the ice-cream van and sheep gather round a very photogenic dew pond. 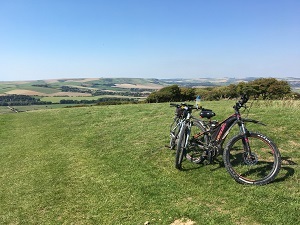 Soon we would get our first view of Mount Caburn and Firle Beacon – guardians of the gateway to the far ,eastern end of the South Downs and a sign that we were nearing home. Not far now. 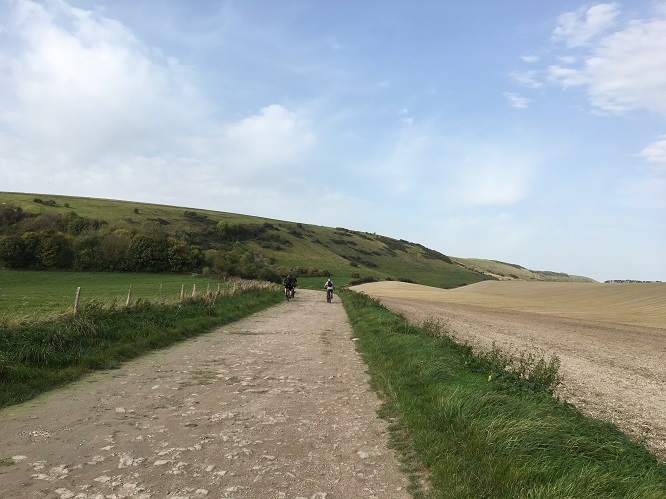 A nice roll along the top towards Alfriston where there is a steep descent into Alfriston which can be deceptively tricky if there are a lot of people on the trail. A little wiggle through the village, past the church, across the little bridge, turn left along the road and then right up a sunken path of flints, mud and roots. Having wound our way to the summit of Windover Hill we were once again on top of the Downs. Heading towards the forest and the descent into Jevington you get the most amazing 360° views of land and sea. It’s impossible to capture in a photograph, but it gives us a great reason to return again and again. 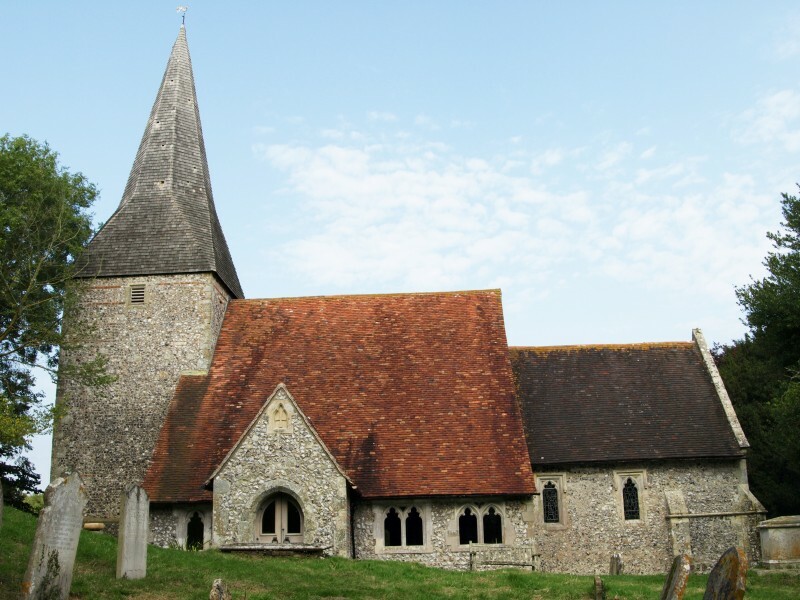 There’s a large stables at Jevington and there are often horses around in the area so it’s good to be aware of that as you wind down the steep path beneath the trees, past the church at Jevington, and then to the road through the village. If you turn left you’ll very quickly come to The Eight Bells pub, a great little pub with a large beer garden serving good beer and food, but we turned right, past the blue plaque declaring the birthplace of Banoffi Pie, and took the second turning on our left on the SDW. Here begins the final big climb of the journey – a typically chalky, flinty and rutted affair. Each of our three days had about 3,500ft of climbing but the climbs on our last day seemed particularly hard. That, combined with a few detours off the SDW, meant that energy levels, both human and electrical, were running low. Both the bikes (my wife’s Liv Vall-E+ 2 and my converted bike) had been faultless the whole trip – surely they wouldn’t let us down now? They didn’t. 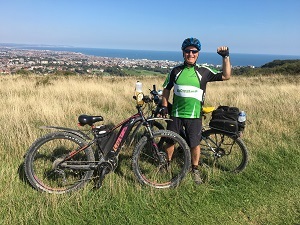 A quick picture by the signpost at the top of the climb; a roll through the golf course and cross the A259; a picture overlooking Eastbourne with the town laid out below us, and then a sprint (and it was a sprint) along the road to the Beachy Head pub. A seat in the sunny beer garden looking back towards the West was the perfect place to sit and toast our efforts and to contemplate the 100 miles (and 30 years!) we had travelled together. A happy birthday! 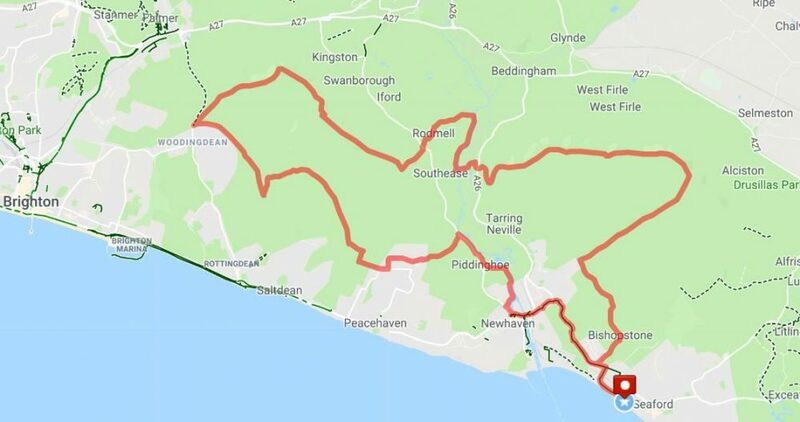 A 23-mile circular ride for mountain bikes over cycle paths, downland, old coach road, heathland, forest, road, bridleways and promenade. I’ve described the route riding in a clockwise direction. 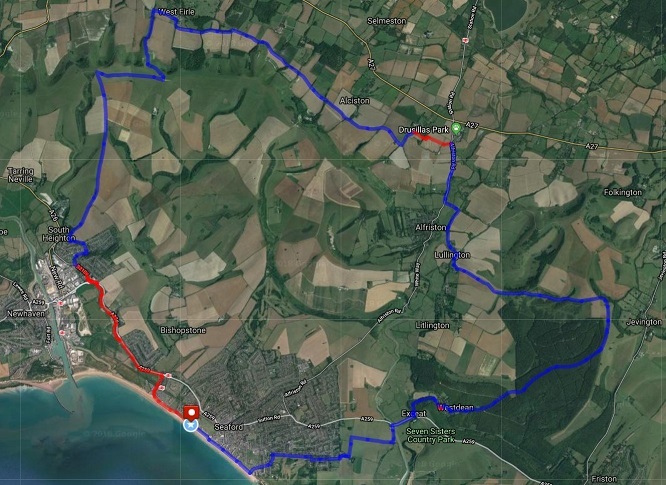 I’ve started the ride from where the ice-cream van normally parks on Seaford seafront near the Salts Recreation Ground. Plenty of free parking to be had there. And ice-cream. And chips. Head West along the seafront on the shared cyclepath all the way towards Newhaven. Stop at the pelican crossing just before the roundabout at Denton Corner where there is a Premier Inn and a large Sainsbury’s supermarket and cross over. We’re heading for the village of Denton which is a right turn immediately before Denton Recreation ground. On Denton Road turn left up Rectory Road opposite The Flying Fish pub. Turn left at the top onto Heighton Road towards South Heighton village. Just past The Hampden Arms pub turn right off the tarmac onto a wide bridlepath beside Old Forge cottage. 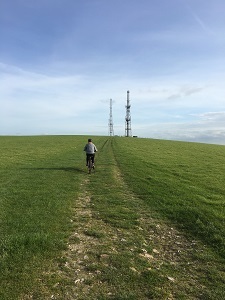 Ignore any turnings and keep to the left as you climb towards The Downs past an old barn and eventually turning right to pass the radio masts on top of Beddingham Hill. 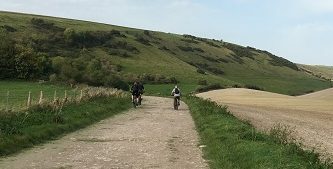 Continue past the aerials on the South Downs Way towards the Firle Beacon car park, but do not enter the car park. 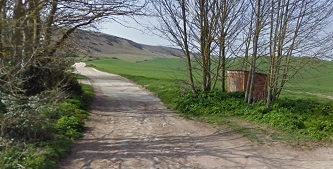 Instead, turn left on the tarmac road and whizz down the hill towards Firle village. Don’t go too fast! Beware of gravel on the road on the bends! You’ll pass two semi-detached brick houses on your right, and then you’ll see an old barn in the field off to your left – be prepared to turn right onto the old coach road immediately opposite the track leading to that old barn. There is The Ram Inn, village store, and Firle Place in Firle village, but our route bypasses all that as you pass a couple of fields and come to a junction at the end of the first section of coach road you turn right and a bit of farm track quickly becomes a wide chalk & flint track heading uphill. 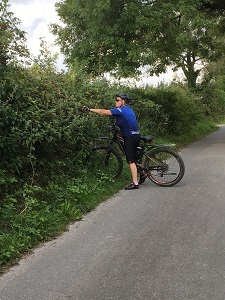 Cycle with consideration for other users of the path and you’ll be slow enough to spot The Beanstalk Tea Gardens tucked away on a bend on your left. There’s a peacock often to be seen hanging around here. Keep following the old coach road as it ambles along eastwards at the foot of The Downs. Be prepared to be passed by the very occasional motorbike or 4×4 as this section of the route is classed as a Byway. Cross straight over Bopeep Lane by Bo-peep Farmhouse and continue East past the bridleway leading to Alciston village and The Rose Cottage Inn which now only offers accommodation. Further along you’ll see the spire of Berwick church in the distance. 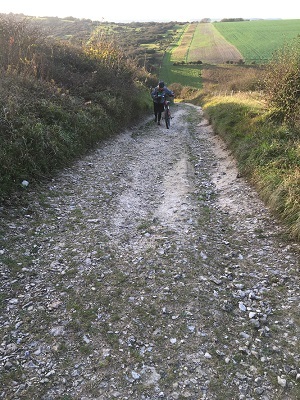 Once you’ve passed a barn conversion on your right you’ll come to a bend with a bridleway that ducks into some low trees and heads south towards Alfriston – ignore it and follow the bend through 90 degrees to the left and head for the church. 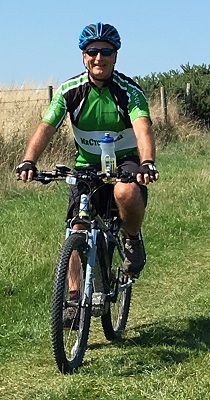 The best way to enter if you’re cycling is through the back gate which is reached by turning right on a bridleway by the large slurry pit as you approach. 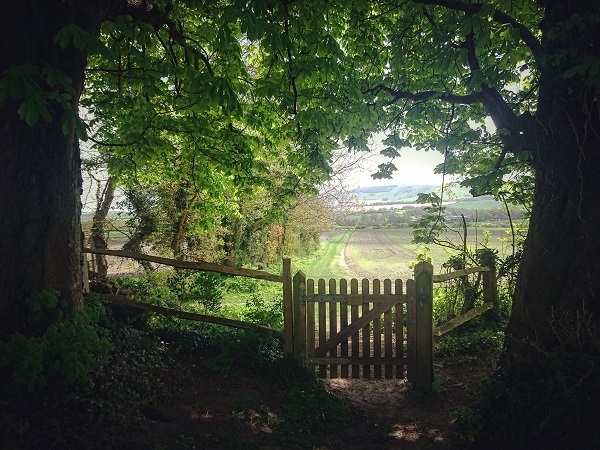 Follow the treeline round and, just after you get the marvellous view towards Milton Street and Wilmington, you’ll come across a small wooden gate giving access to the churchyard. Leave your bike there, and any muddy shoes outside, if you plan to take a look at the murals in the church. 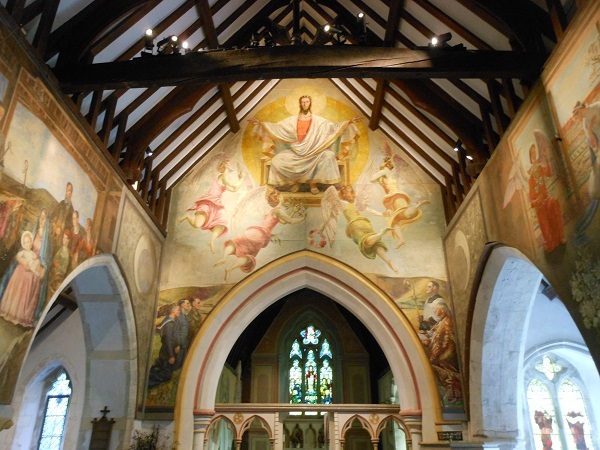 St. Michael & All Angels church at Berwick is not only a fine example of a downland church, it’s also home to some significant murals by the Bloomsbury artists Duncan Grant, Vanessa Bell and Quentin Bell. The village is also home to the delightfully unspoilt Cricketers pub. If you stop for lunch there on a warm summer day they have been known to refill drink bottles complete with ice cubes! 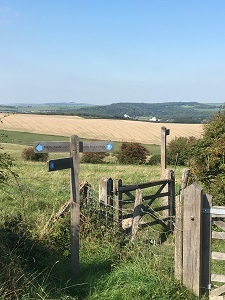 When you continue your journey you’ll be heading down the bridleway leading away from the churchyard gate which spits you out onto the Alfriston Road near Drusillas Zoo Park. Turn right towards Alfriston village (plenty of refreshment opportunities there) but just before you reach the village turn left onto Lullington Road and over the little hump-back bridge over the River Cuckmere. Follow the road round to the right until you come to a T-Junction by a massive flint and wooden barn. Turn right but soon you turn left off-road again onto a bridleway just past the big flint house next to the barn and the little, red postbox. It’s a long chalky, flinty, gravelly drag to the top of the hill now where you will find Lullington Heath Nature Reserve and the true, little oasis that is Winchester’s Pond and its hidden bench. A chance for some rest and relaxation in a tranquil spot. From here there’s some downhill and then a very steep climb back up to meet the South Downs Way very briefly before turning south towards the back of Friston Forest besides the gallops above Jevington. Plunging into the forest is always enjoyable but on an autumn afternoon it often yields exquisite treasures. Wind your way down through the forest (you’re bound to get lost but don’t worry!) 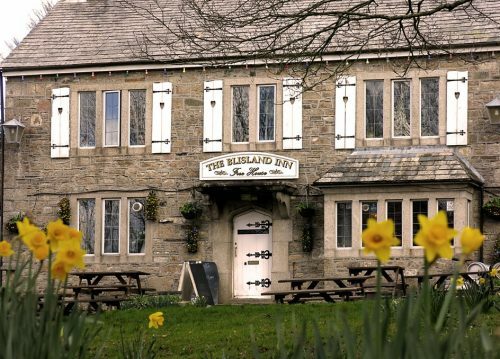 until you reach the tiny village of West Dean tucked between its historical church and pond. If the route through the forest looks too muddy (and it can get incredibly muddy!) then take the road. Either way, you need to end up at the T-junction with the A259 at the bottom of Exceat Hill waiting for a kind motorist or two to let you turn right onto the A259 towards Seaford. Don’t worry! 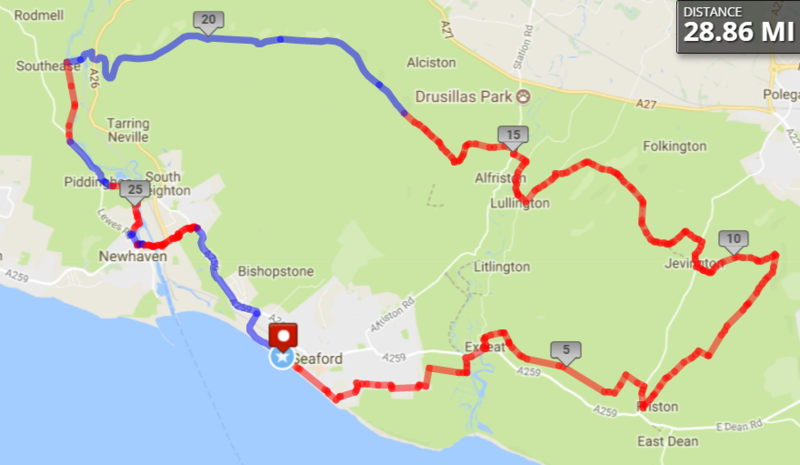 You don’t need to go far on the road and you don’t need to cycle up the road into Seaford – we’re following the Sustrans NCR 2 Cycle Route. Cross the bridge over the Cuckmere River in front of The Cuckmere Inn and immediately turn left into the pub car park. At the far end of the car park go through a small wooden gate (marked NCR 2) and follow the permissive path towards the sea. You may need to give way to pedestrians along here – especially at weekends. 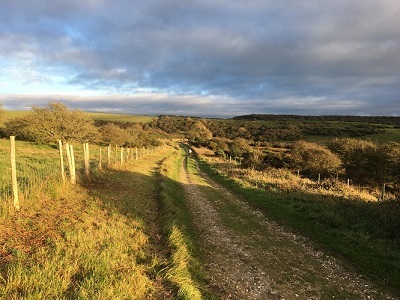 Take the first right through another gate and follow the route uphill through a couple of sheep fields until eventually you pop out onto an unmade track called Chyngton Lane, at the top of Chyngton Way, at the foot of the concrete road that leads up to Seaford Head car park. Follow the road and NCR 2 down Chyngton Way towards the seafront and back to the start point. 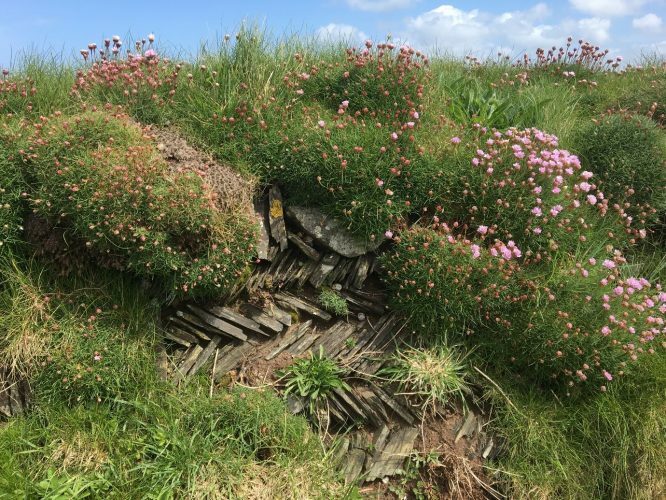 Cornwall – Moor To Sea! It was a revelation! 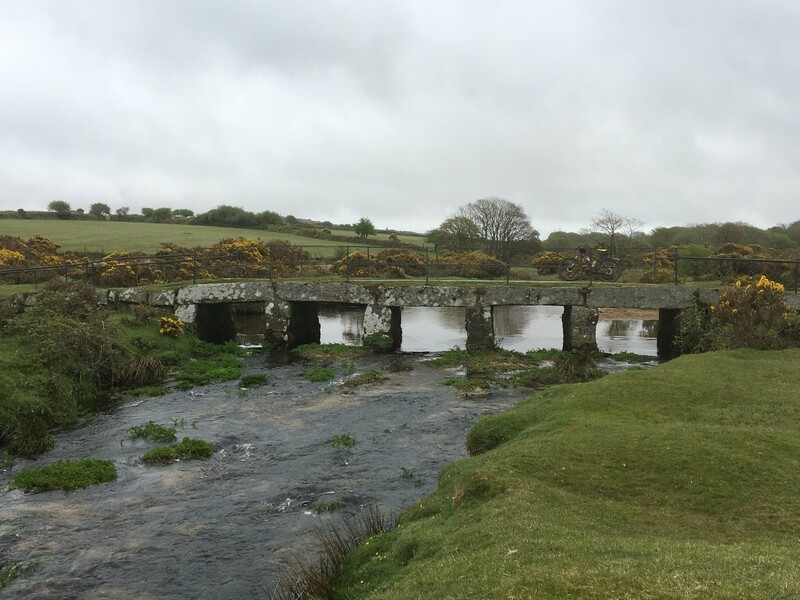 Despite nearly completing fifty-two orbits of the sun, I’d never crossed The Tamar river into Cornwall – until this year. Why did I leave it so long? 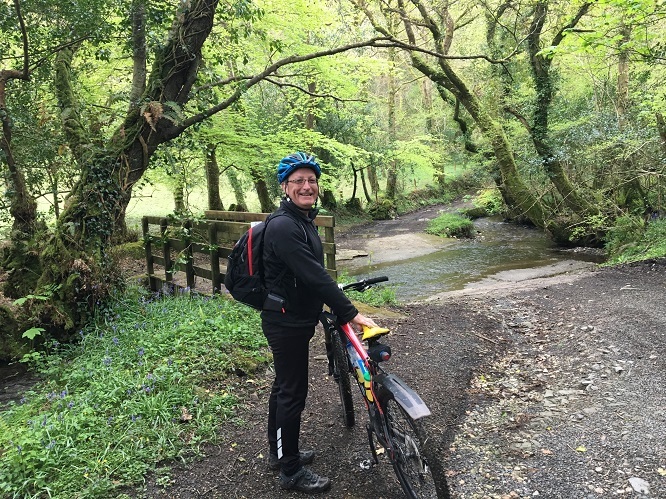 I don’t know, but after my wife and I enjoying a glorious week cycling out from The Old Chapel cottage near Wadebridge between Padstow and Bodmin we’ll be back soon! 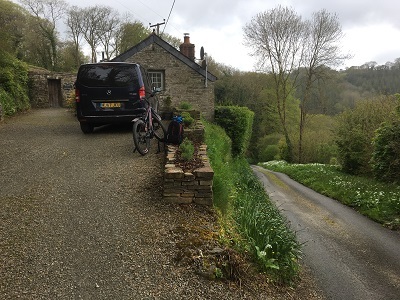 It was a long, six-hour drive to the land of tin and Tintagel from our home in Sussex by the Sea but finally we turned left by the old, red telephone box into a sunken lane not much wider than our van. As our bikes jiggled in the back, and we headed downhill past ancient farmsteads and cottages, hoping not to meet another vehicle (we never did), it struck me that here was a part of England that it is quite easy to lose yourself in and hide away from the world. A feeling reinforced as we splashed across the ford at the bottom of the hill and climbed again, squeezing through banks of wild garlic, and slowly crested another hill. Cornwall was already working its charms and slowing us down. And there it was – The Old Chapel cottage – a tiny granite building tucked into the hillside overlooking a thickly-wooded valley. This was to be our home for the next week as we explored the cycle trail which was waiting for us somewhere down the steep hill, between the trees, beside the meandering River Camel. As with any UK holiday we were ready for all weathers (although there was an emergency visit to Bodmin for boots, warm socks, and a woolly jumper) but the thick, stone walls and log-burner meant that The Old Chapel was truly a ‘cosy cottage’, and with the indoor pool and sauna available should cold or stiff muscles need reviving, we were ready to begin our Cornish adventure. Our cycling legs may have been a bit rusty after a long, wet winter, but as the next morning dawned bright and clear we were ready to roll. The Camel Trail is a bridleway which runs for about 18 miles along two sections of disused railway from the port of Padstow, via Wadebridge, to Wenfordbridge on the edge of Bodmin Moor. 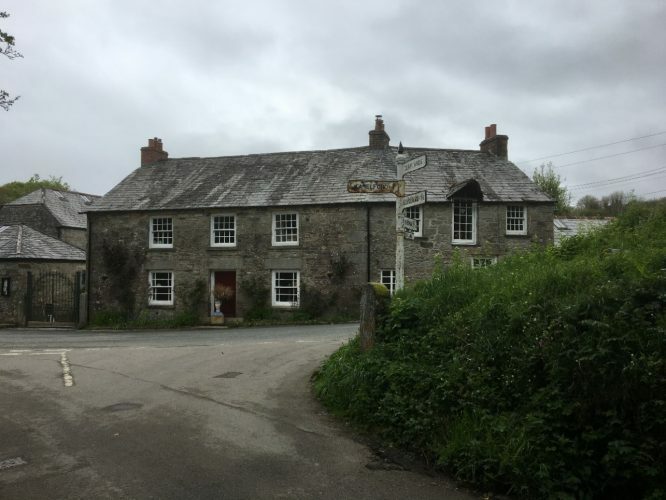 There’s also a short off-shoot at Dunmere (near the excellent value of the Borough Arms carvery) to the former county town of Bodmin. 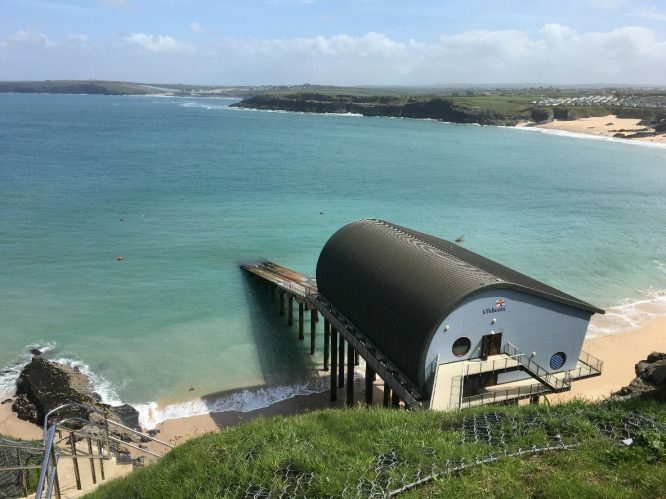 The railway was used to carry sand to inland farms for fertiliser, as well as slate and china clay to ships at Padstow and fish from there to London and other cities. The last passenger train was in 1967 and freight finally ceased in 1983. 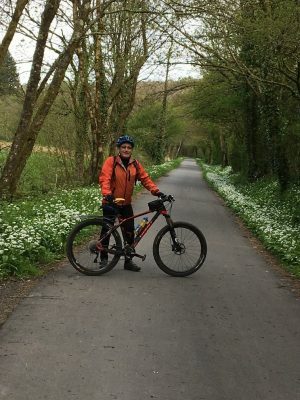 Of course, the beauty of a cycle trail on a disused railway is that it will be reasonably straight and fairly flat, and we’d chosen our base near the middle of The Camel Trail to take full advantage of those facts. 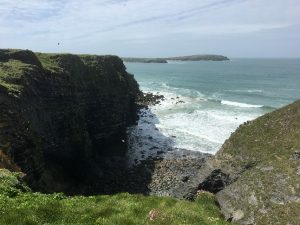 Our plan was to pootle up and down the trail enjoying the wonderful views, pub lunches and cream teas, with occasional loops off to explore further, and to build up our daily mileage slowly. It almost went to plan. In our excitement to get going we turned left instead of right, and we were almost to Bodmin before realising our mistake and heading back for Padstow. 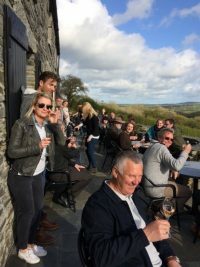 On the plus side, we learnt where The Borough Arms pub, Camel Trail Tea Garden and Camel Valley Vineyard were – all with direct access to the trail. After 36 miles on our first day we felt we deserved the cocktail and crab sandwich overlooking Padstow harbour, and the cream tea back up the trail a few short miles past our cottage. Best scones I’ve tasted. Well worth the extra pedalling! And that set the tone really. Cornwall had us by the taste buds! Having lived all my life in East Sussex near Lewes I’m familiar with towns and villages closing the roads and taking to the streets with flaming torches, wearing strange costumes and setting off fireworks. Oh, and drinking the odd beer or two. All of which culminates on November 5th with tens of thousands of people packing into the narrow streets of Lewes to celebrate the spirit of bonfire. 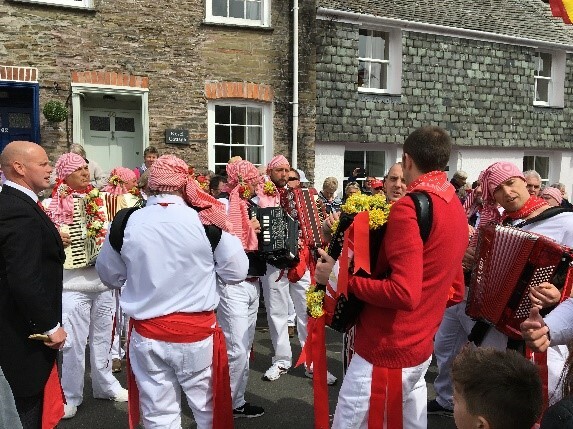 So I was quite intrigued by the May Day celebrations held each year in Padstow on May 1st which date back to times long-forgotten. A chance not to be missed. And a golden opportunity to ride smugly into town where no car was allowed to go. Chatting to the locals it was clearly a day for members of Padstow families to return to their town, their relatives and their roots. Oh, and wear strange ‘Obby Oss’ costumes. Two of which took to the streets at various times whirling and dancing through the town. One taunted and followed by the red faction, and the other taunted and followed by the blue faction. 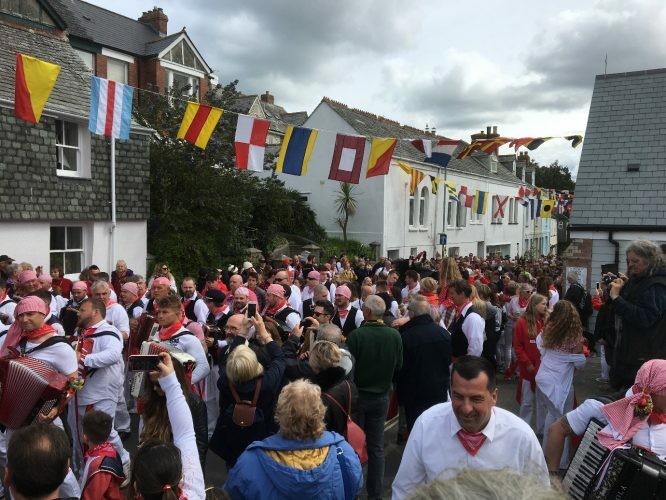 Much jollity, singing, street performers, processions and drinking ensued across a 3-day period at all hours of the day and night with the town and harbour festooned with flags and bunting. Great fun. 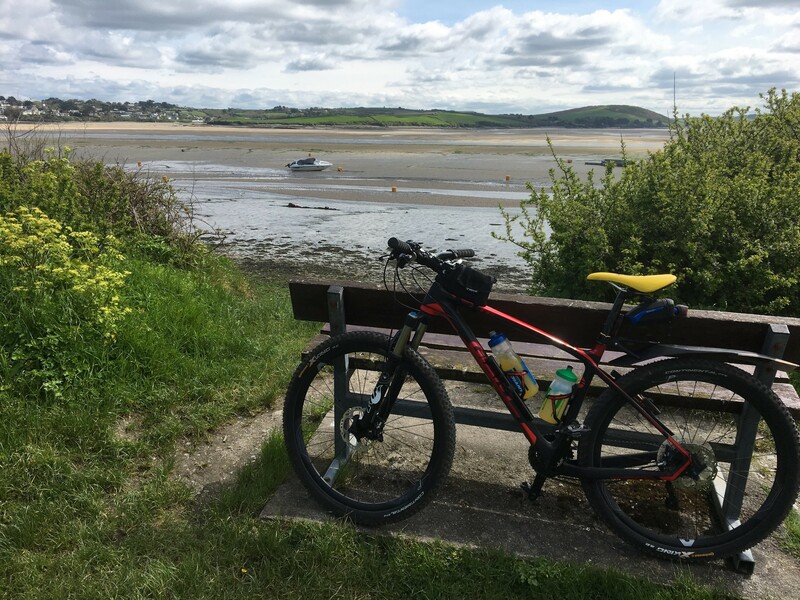 Off the Camel Trail and Over the Hump! The Camel Trail is great. 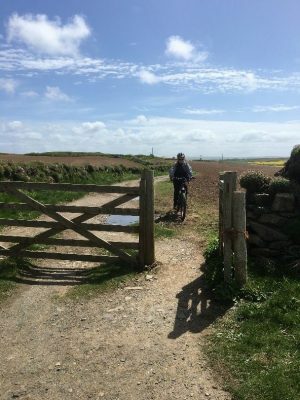 It’s a fantastic resource for Cornwall that allows tourists to cycle freely in (almost) a totally car-free environment, and locals to travel between towns and villages along a flat, easy route. It can get very busy at times though – weekends, school holidays. So I was keen to test the waters (and the hills!) 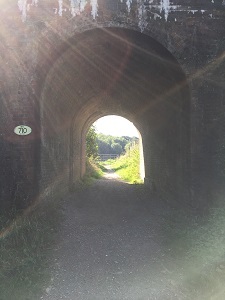 beyond the Camel Trail. 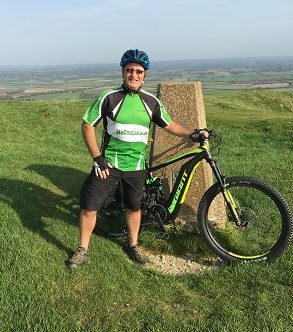 I knew my wife would cope on her electric bike, but with demand high for our fleet of electric test bikes I was on my normal mountain bike. How would I get on? The Cornish coast is famous for its valleys and cliffs, and if you go down to the sea it’s surely going to be up all the way back! 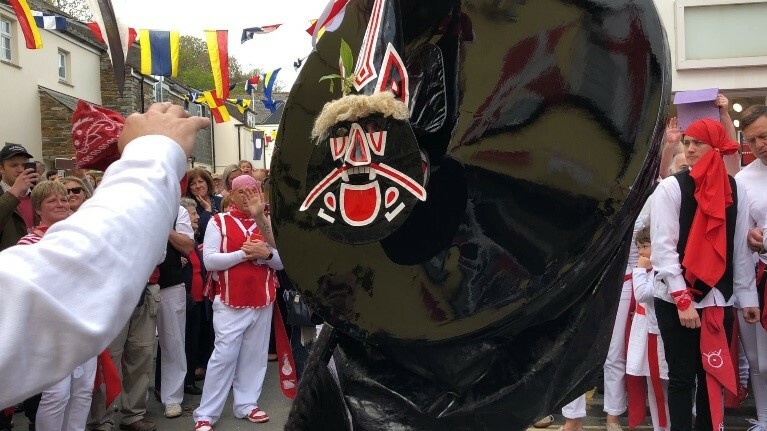 As I sweated my way uphill out of Padstow in the spring sunshine, past the high wall surrounding the deer park of Prideaux Place, I’ll admit to being a little trepidatious for my fitness – and I also spared a thought for those whirling under the warmth and weight of the Obby Oss costumes. But as we crested the hill, and the road became a track, I grew more optimistic, and then Trevone Bay came into view. A great little beach, with a great little café, and a server who knew someone in need of an extra shot of espresso when he saw one. A successful first foray – there would be more to come. 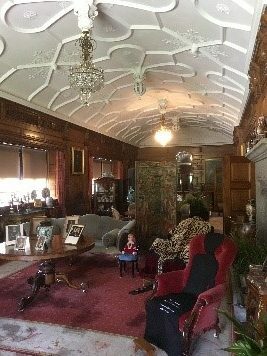 The house is a superb example of a Victorian country home and The National Trust and their volunteers have really breathed life back into the house. The stories of the people who lived and worked there were illustrated superbly with talks, sights, sounds and even smells! The sound of the maid singing in the servants’ quarters was at once both beautiful and eerie. 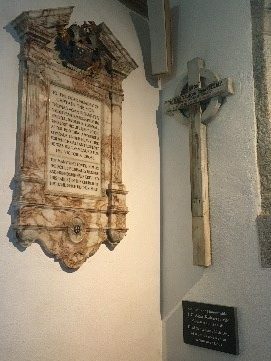 The life of beloved eldest son and heir, Thomas Agar-Robartes, both inspiring and sad. The 17th century plasterwork on the ceiling of the Long Gallery simply awesome. 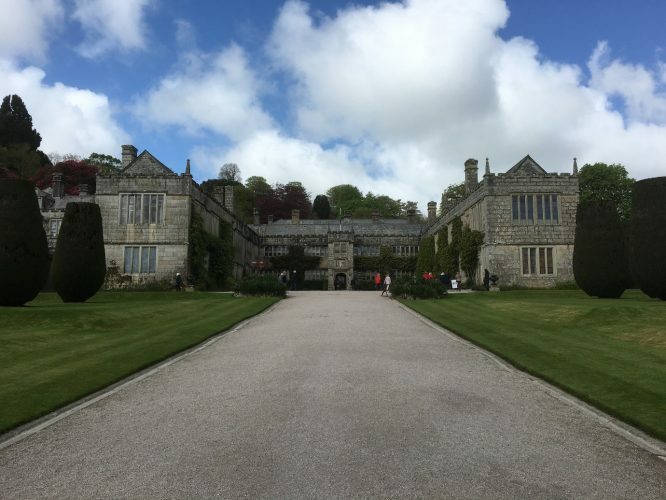 With hindsight, we could have cycled to Lanhydrock. We certainly could have cycled once we got there, with 10km of cycle tracks on the estate to suit all abilities and bikes for hire. And we certainly could have used a bike to cover the ground through the fifty-three rooms we spent hours walking through, let alone the gardens. Definitely somewhere worth visiting again and again. We were glad we got there early though and managed to do the house justice, if not the gardens. 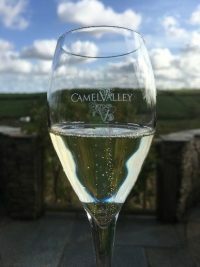 However, we had an early evening appointment to keep, just along the trail from our cottage, at Camel Valley Vineyard. We were definitely going there by bike. 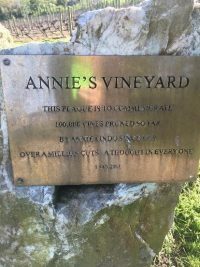 Camel Valley Vineyard – Bob and Annie’s Corker! 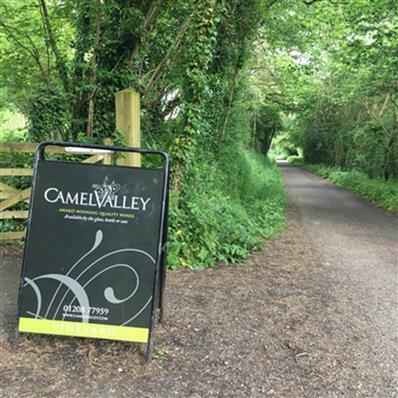 We’d seen it on our very first excursion along the Camel Trail – a vineyard that welcomed cyclists and produced world-class sparkling wine. I’d booked us on the Wednesday night Grand Tour & Tasting and we cycled up to the winery in the early evening sunshine. As we parked our bikes next to the Audis and BMWs and hurried to join the rest of the group I was hoping the tour would live up to my expectations. I needn’t have worried. Our guide for the evening through the winery and the tasting (five glasses of bubbly – thank goodness we were on the bikes!) was none other than top man, showman, and all round good egg, Bob Lindo. Who, together with his wife Annie, and son Sam, makes sparkling wine that has been judged by those who should know to be among the world’s finest. As we sat sipping our glasses of bubbly on the terrace overlooking the vineyard I could only agree. 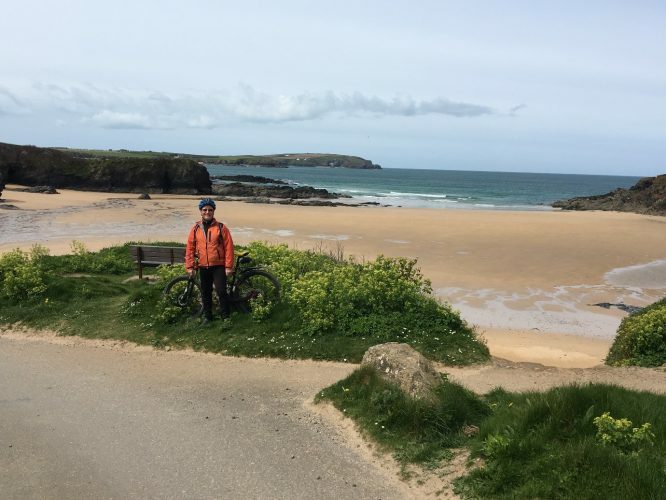 After the success of our initial cycle off The Camel Trail to Trevone Bay we were determined to explore further. Having lived by the sea all my life I enjoy a good beach – especially a sandy beach. Something which Sussex doesn’t have enough of. Let me tell you – Cornwall has them in bucket (and spade) loads! Once again we headed west along the Came Trail, up through the streets of Padstow, past Prideaux Place (closed for filming), and on towards the hamlets of Trethillick and Crugmeer and then, just before the steep descent to Lellizzick, we to the path that led across a field, through a stone wall (where we parked our bikes), along a stream and between the bushes until it opened up onto the wide, empty, sandy expanse that is Harbour Cove. A great start to our beach day. Retracing our route to Crugmeer, we then turned back towards the coast and Trevone Bay. Before we got there, a track to our right and a gateway at the end, caught my eye. It had to be explored. As ever, the Cornish coastline did not disappoint. But it wasn’t just the cliffs and sea that caught my eye. It seemed like every element that went to make up the scene was shouting for my attention. As gulls wheeled and cried below, even the stone walls were fighting to be seen. Not to be outdone, the turf beneath my feet was the softest and most springy I’ve ever trodden. Eventually we tore ourselves away and trundled downhill to the beach at Trevone Bay. 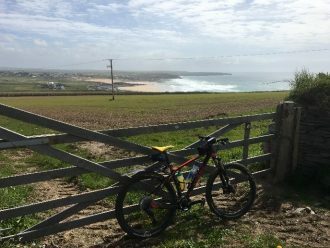 We passed the café and wound our way uphill, turning right at the top for a brief dash along the B3276, and then downhill again to the sands of Harlyn Bay. 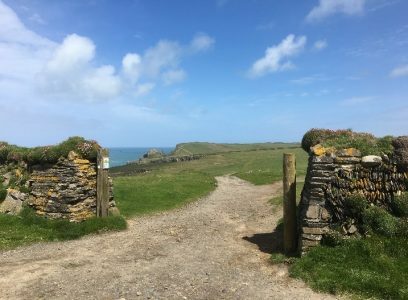 We pushed on across the little, stone bridge, and then uphill, heading for the dramatically situated Padstow lifeboat station, which isn’t in Padstow, but instead perches below the cliffs at the far end of Mother Ivey’s Bay. Before we got there, I spotted a bench sitting high on its own. Surely it was placed there to take advantage of a spectacular view? A bird of prey sitting on a stone cairn seemed to favour the spot too. Once again, we weren’t disappointed as Cornwall smacked us in the face with its rugged beauty. Hats off to the hardy souls who launch themselves into those waters when duty calls. 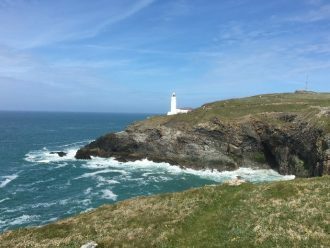 From the lifeboat station we crossed the headland and headed for the western tip of Trevose Head where the lighthouse sits. There we sat and contemplated the views south towards Constantine Bay and beyond. With our seaside excursion a resounding success we retraced our route until we reached the B3276. We turned to port, and, with a kind breeze over our stern, we flew downhill all the way back to Padstow. 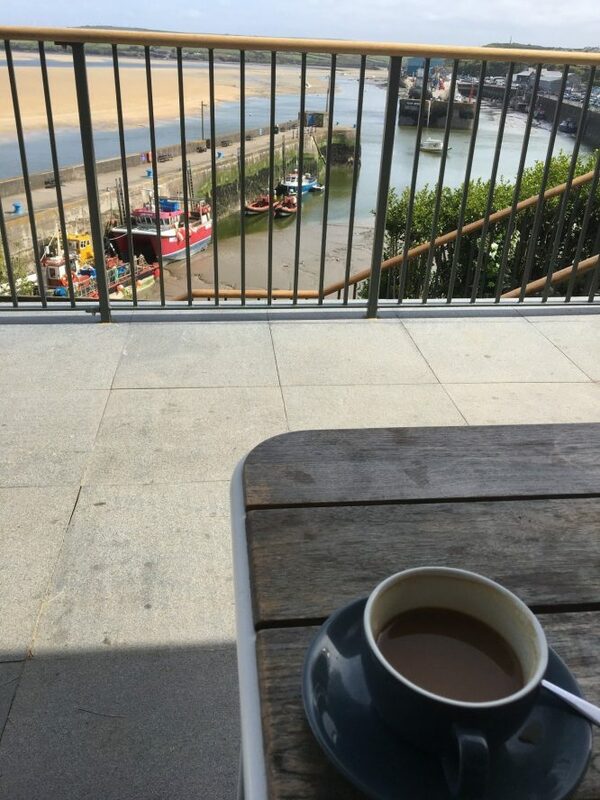 With a loaf of crusty bread in my rucksack, and sipping a coffee overlooking the harbour, I realised I’d completely underestimated the number of spectacular coves and sandy beaches there are to explore in Cornwall – many return trips are needed! And if, in the first week of May, those blue waters were too cold to swim in, at least we had the indoor pool at the end of our day. 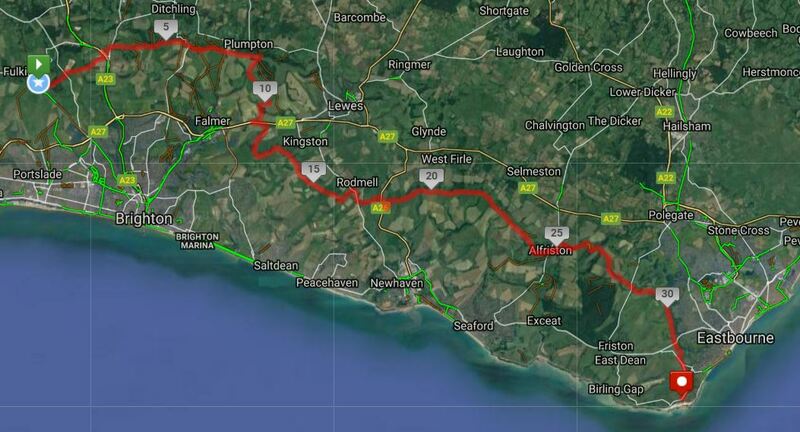 And so went the discussion at breakfast as I plotted our route to the eastern end of the Camel Trail. 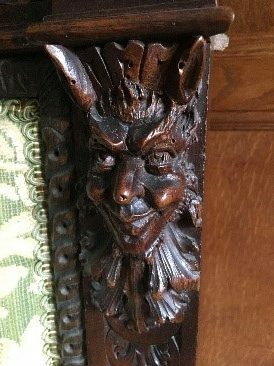 “We’ll head up through St. Breward, across the moor, and then down through a place called Blisland, before re-joining the Trail at Merry Meeting.” A route containing Bliss and Merry – what could possibly go wrong…? 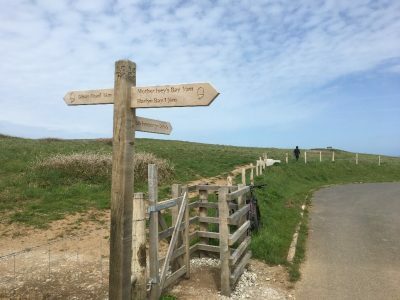 Now, on a path like the Camel Valley Cycle Trail, you could be forgiven for thinking that you couldn’t go wrong. Flat, wide, well-signposted. Easy. Wrong. For the vast majority of the route it is very easy to follow and plainly signed. There are a few exceptions to this. 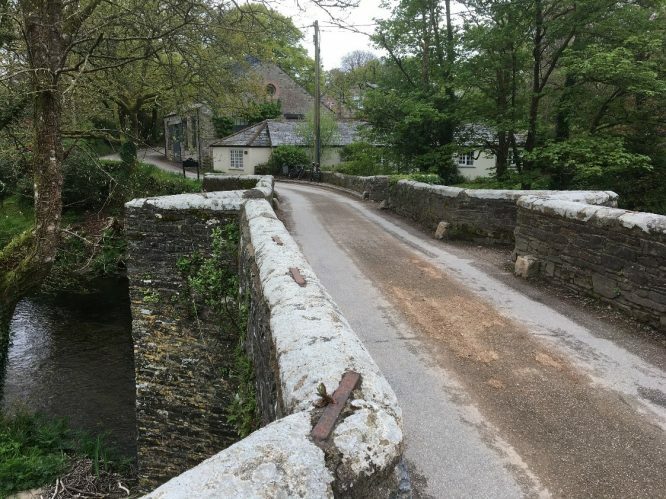 One is the little bit that uses the roads through Wadebridge, the other is the turn north at Dunmere that bypasses the spur into Bodmin. We definitely knew we’d gone wrong when we reached Sainsbury’s in Bodmin. Useful if we’d wanted supplies but not when trying to navigate to the upper reaches of the River Camel. There were no cute ponies grazing the wide, rugged expanse of Sainsbury’s car park. We back-tracked to Bodmin jail. An impressive building, whichever way you look at it. Relying on my GPS device to get us back on track, I struggled up past the entrance to the jail, watching my wife disappear up Bodiniel Road and then along Copshorn Road. At some point the road turned into a steep track, which then headed downhill to a small river (or was it a large stream?). The GPS was adamantly beeping and showing the way. Reproachful looks from wife as the trail got steeper and rougher. We passed an abandoned lady’s shoe half-buried in the scree. It got very muddy. “I’m sure it’ll be easier from here,” I said, more with hope than conviction. But it did improve. The track became a road. A very steep road, but a road nonetheless. And there was another cyclist. He was going in the opposite direction but he offered me words of encouragement as I pushed my bike up the hill. I’d seen the black chevrons of doom that indicate a steep gradient across many of the roads near our route today as I’d plotted our course on one of my beloved Ordnance Survey maps. 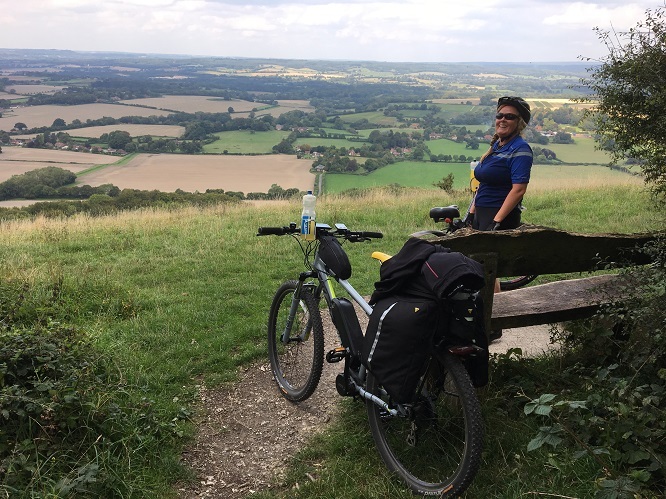 The hill wasn’t a problem to my wife on her electric bike though and offered her a chance to enjoy my suffering as some sort of revenge for my navigational faux pas. Finally we rejoined the Camel Trail at Helland Bridge. I hoped we’d see it again on the way back! You can’t mistake the trail here as the railway lines are still embedded in the road surface as it crosses the road. 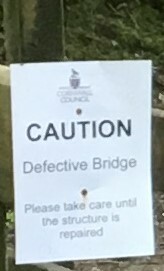 It’s worth a short detour down to the riverside to see the medieval bridge which wears the centuries with a quiet, shabby dignity. The first recorded mention of it is in 1381, and here it lies in quiet repose like a proud tramp whose well-worn suit was once an expensive tweed. I may be wrong, but this whole section of the Camel Trail from Dunmere to Wenfordbridge seems slightly down on its luck – neglected even. Definitely not as well signed as other sections of the trail but absolutely worth a visit. Especially when the flow of tourists further west begin to swell. The sense of slow decay is further heightened as you pass the extensive, grade 2 listed remains of the old china clay buildings known as Wenford Dries. But before you get too despondent you soon arrive at the end of the trail at Wenfordbridge and the little gem that is the Snail’s Pace Café. Refuelled on home-made cakes and delicious coffee we turned right and headed off uphill (of course!) towards St. Breward following what turned out to be a well-marked loop of the National Cycle Route No.3 which would lead us across a section of Bodmin Moor and back to the trail at Merry Meeting. We hoped. We ignored the ‘Road Closed Ahead’ and diversion signs. Surely they didn’t apply to bikes? Thankfully we managed to squeeze past the roadworks in St. Breward and stick to our route. All too soon we were rolling down, off the moors, through the picture postcard village that has the intriguing name of Blisland. Complete with many stone cottages, a village green, and a pub that looked well-worth a return visit. Then down down down a long, narrow road where we hoped we wouldn’t meet anything coming the other way (we didn’t) to where the railway lines were in the tarmac once again, and the Camel Trail crossed the road. 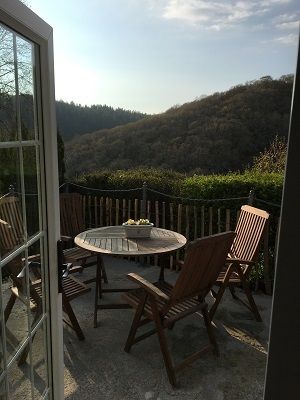 We turned left and headed back along the densely-wooded valley towards Wadebridge and our cosy hill-side cottage. We were tired, but it was a happy tired. We may have missed the turn at Dunmere, and certainly done more than we intended, but we’d ridden to the ends of the trail and beyond. We were coming to the end of our first visit to Cornwall, but we weren’t downhearted because we knew we’d be back. There was still more to see. 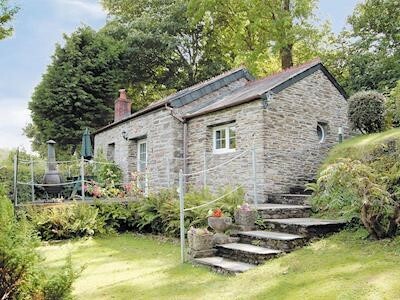 The Old Chapel cottage, Polbrock, near Washaway: contact rod@mrcycles.co.uk for booking details. There are two cottages on-site, one 1-bedroom and one 2-bedroom. 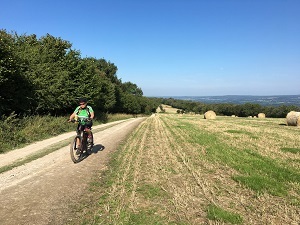 A 30-mile circular ride for mountain bikes over cycle paths, downland, quiet roads and by-ways, bridleways and promenade. I’ve described the route riding in a clockwise direction. Head West along the seafront on the shared cyclepath all the way towards Newhaven. Cross the bridge at Newhaven, but, at the Pelican crossing on the far side of the bridge, cross over towards Denton Island and pick up the cycle path on that side of the ring road. Just past the subway entrance on your left turn right onto Elphick Road. Follow it to the rear of The Jolly Boatman pub by Lewes Road recreation ground and turn right onto Robinson Road. Then take the path that passes behind the swings and then runs northwards parallel to the river. You are now crossing Newhaven’s old rubbish dump which was capped with spoil from excavating Brighton Marina. When the path runs out back by the riverbank turn left towards Piddinghoe. When you get to Piddinghoe Pond, home to Newhaven and Seaford Sailing Club, turn left onto the track that runs behind the dinghies parked beside the lake and the clubhouse. Cross the small car park and pop out onto the road. Turn right to cycle all the way through the village until you reach the T-junction with the C7. Beware fast traffic. Turn right and cycle about a mile towards Lewes before turning left onto a wide gravel track opposite the start/end of the Egrets Way.